I especially wanted to save Gladiolus 'Atom'. 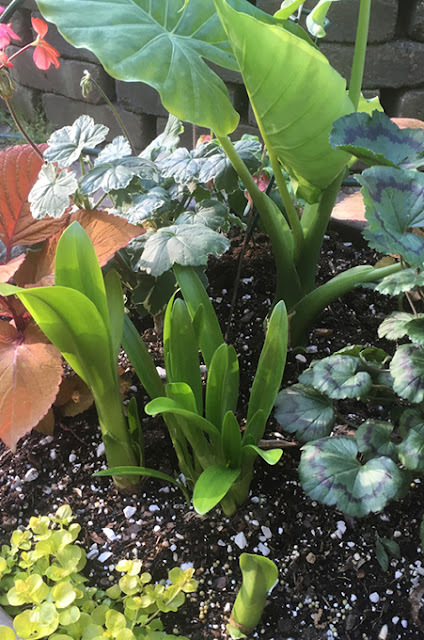 Digging bulbs can be be a cinch if you know where you planted them. 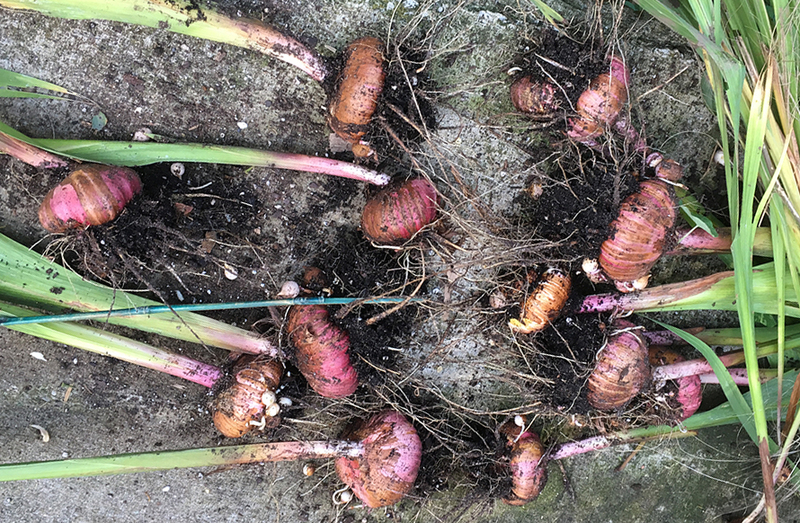 I grew several non-hardy bulbs this summer, some of which were hard to find, tricky to cultivate, or incredibly attractive, making me want to grow them again. I'd never gone to the trouble of digging Glads before, but I'm completely in love with the lipstick red 'Atom' with its delicate white edging. The variety called 'Starface' is one I don't plan to be without, with its tropical peach and yellow coloration. 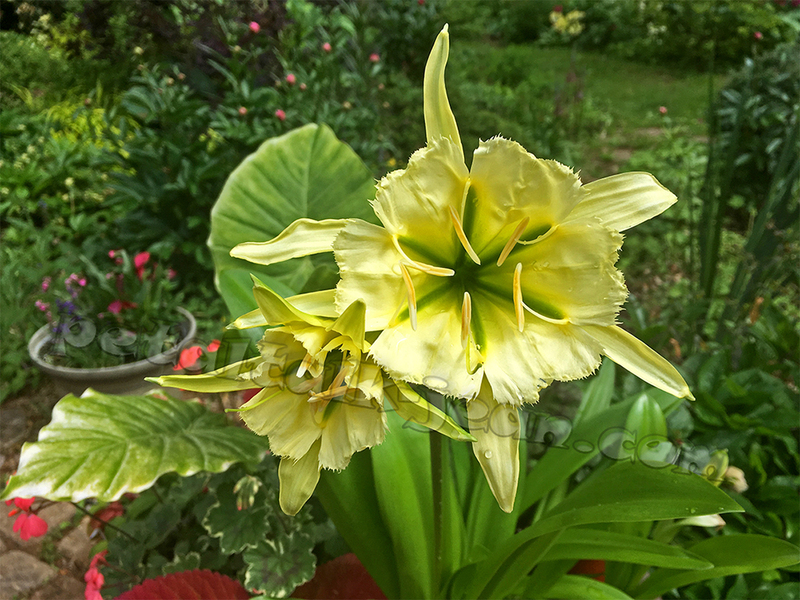 And then there is 'Lucky Star', which actually bloomed twice from one bulb and has such a non-glad look I couldn't let it go. 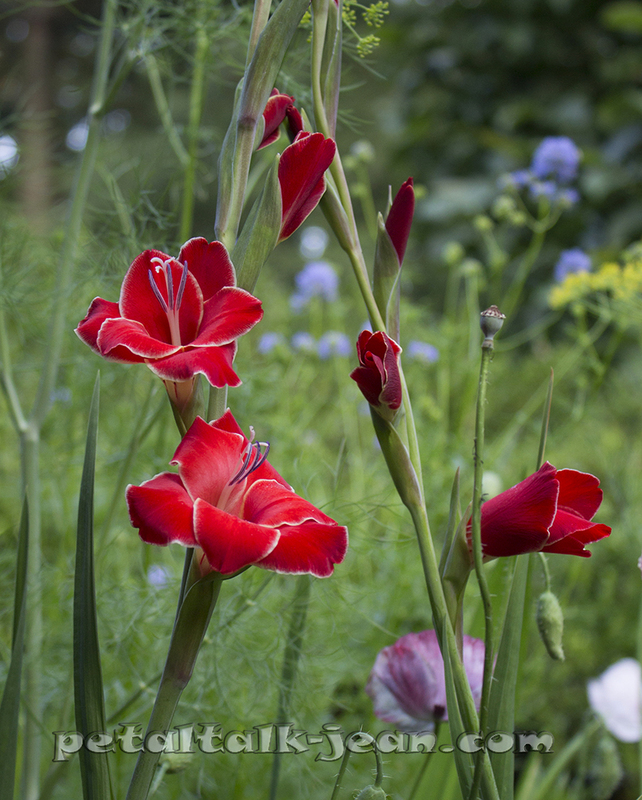 If you even think you might be digging bulbs in the fall, leave at least part of the stem on the plant. In the case of Gladiolus, it's easy, as healthy leaves don't detract from the garden, nor do they take up much space. But there's another advantage to leaving on the leaves. 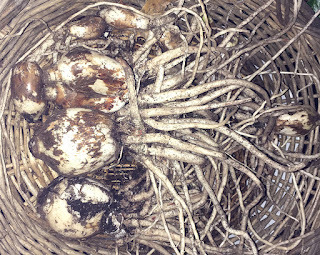 They take up and store nutrients gathered from the sun, shoring up strength in the bulbs for next year. Use a digging fork and dig a few inches further out from where you imagine the bulbs are so you don't skewer any of them. 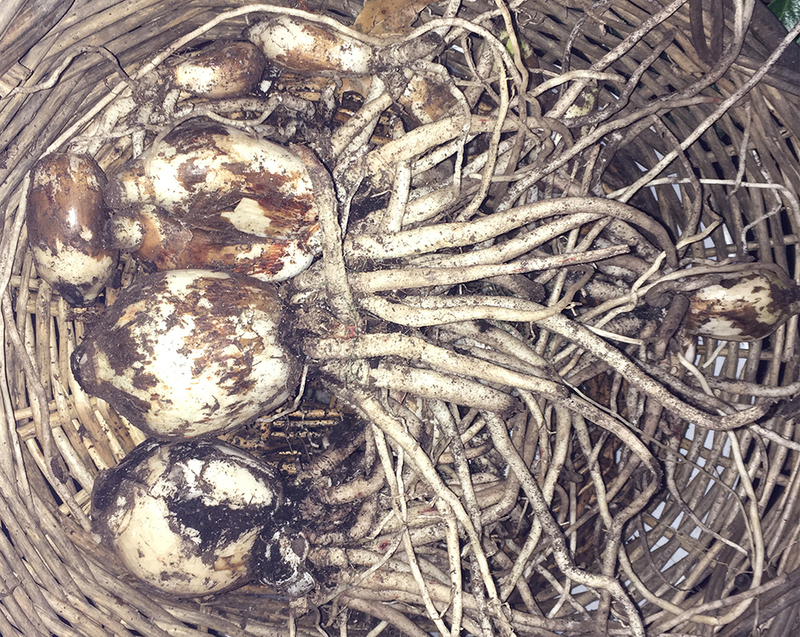 Let the bulbs dry for a couple of days before storing them, making sure any soil that might have adhered to them is removed. 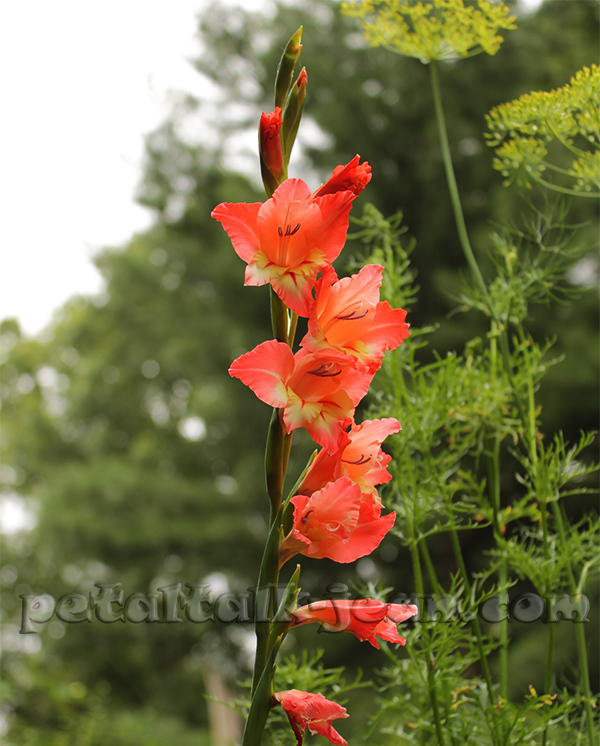 I didn't rinse the Gladiolus bulbs (more accurately called corms) because I can't count on any dry, sunny days in late October. Finally, during the summer, take photos of the flowers from bulbs you might want to save so that you remember where they are in your garden. It will also remind you how pretty they are. after I'd planted the bulbs. 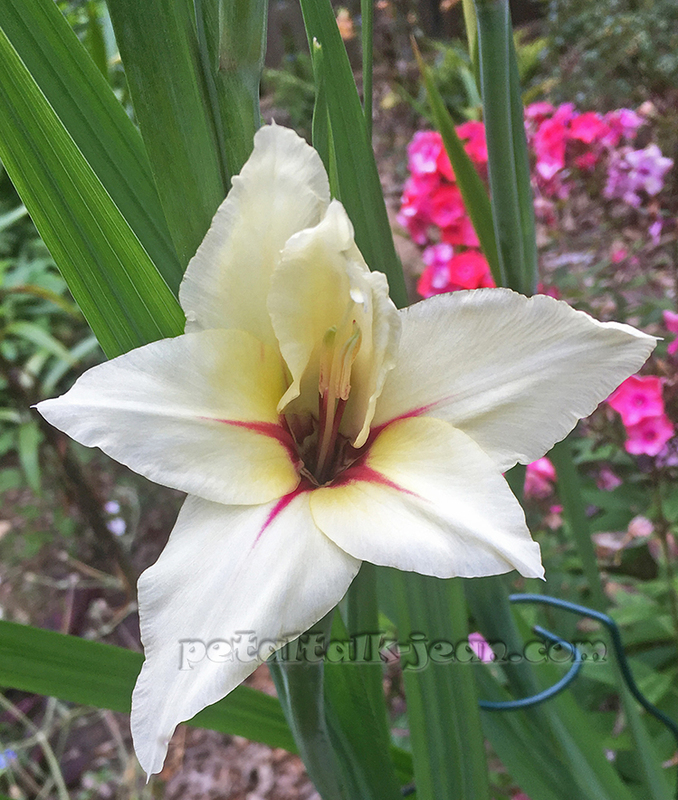 The other tropical bulbs I planned on digging were the Peruvian daffodils, or Hymenocallis 'Sulphur Queen'. I'd planted the three large bulbs in a large container with other plants, and amazingly it bloomed by late May. The Peruvian daffodil put out two stems with blooms out of the three bulbs I planted. But they lasted a nice, long time. 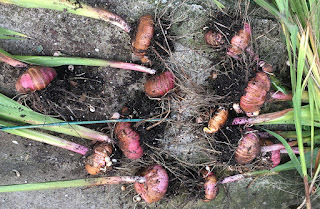 The problems arose when I went to dig the bulbs up to store indoors for winter. The foliage had died back in July, and by October the only thing left on the surface were a few limp, dead leaves. I knew the bulbs were down there, but they seemed to have sunk to a level I couldn't reach without dumping the entire container upside down and then prying the clump of bulbs from the cold, damp soil's grasp. Three bulbs became several, but the original three were the only ones of good size. Then I read that the most successful method of overwintering Hymenocallis was in soil, so I planted them in potting soil to which I'd added medium granite chicken grit for drainage and watered them very lightly, just until water came out of the bottom of the pots. Next season, the Hymenocallis will get their own pot, either one large container for all of the bulbs, or two of medium size. They'll be much easier to store for winter that way. It could be awhile before I can actually put these bulbs and corms to bed for the winter. They're not completely dry yet, and it hasn't stopped raining since I dug them up. I'm sure I'll find a way though. I'm really looking forward to growing them again next season.